The guys at Portland area Ducati dealer MotoCorsa are building and riding some pretty unique bikes. 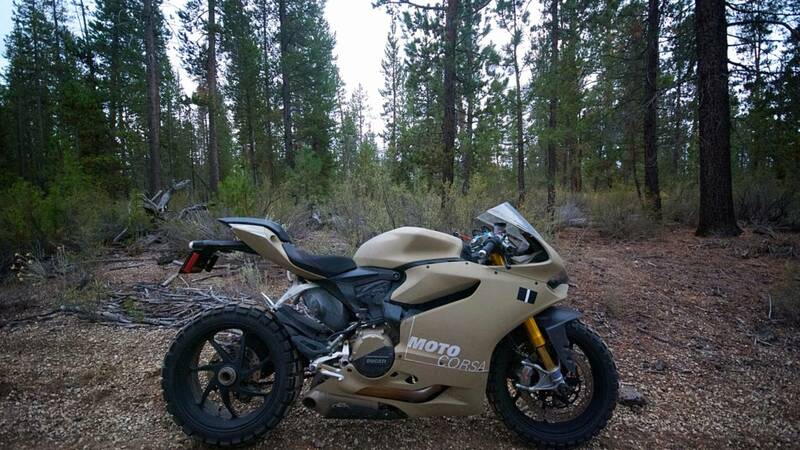 Like this 2013 Ducati 1199 Panigale S, modified to go off-road. 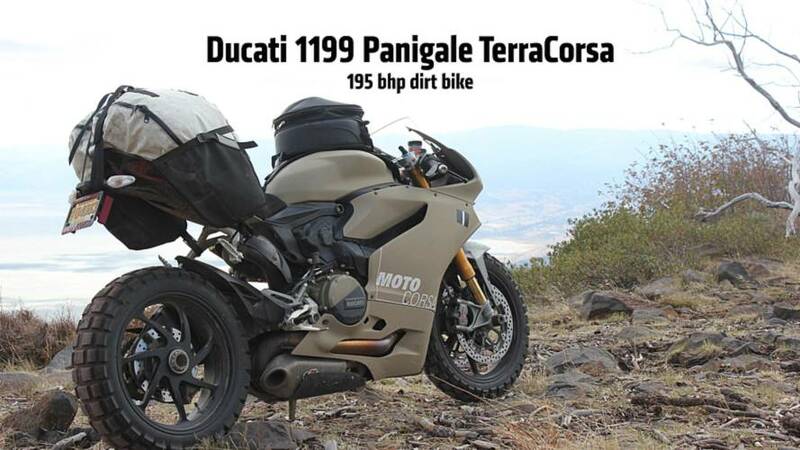 They just got back from a three-day, off-road trip and here's exclusive photos, video and details of what they're calling the Ducati 1199 Panigale TerraCorsa. 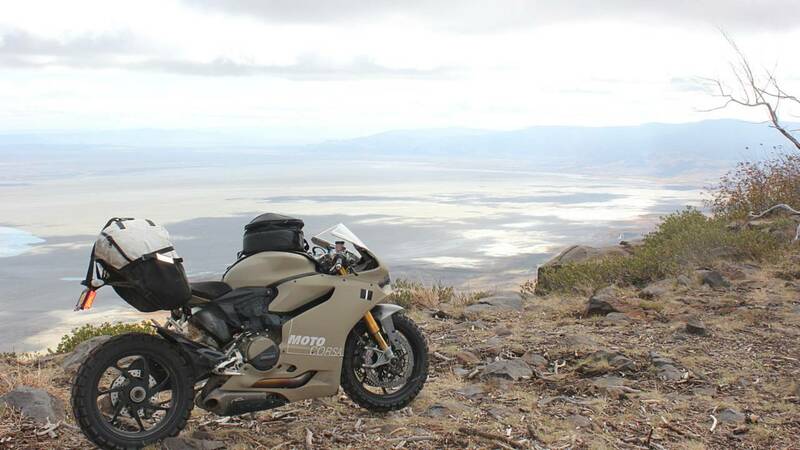 "We do an annual off-road trip with a few friends, down in Southeastern Oregon, out in the middle of nowhere," MotoCorsa's general manage and Nair customer of the month Arun Sharma told us. "I was planning on taking my Multistrada, but happened to have my track Panigale on the lift next to it." 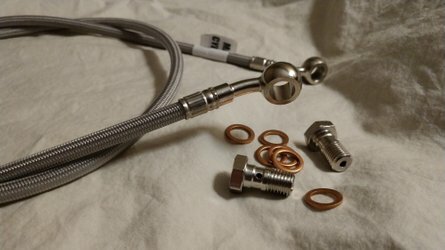 "I had a set of Continental TKC80s to put on it, when one of my friends comes in and says,'You know what you should do? Put those TKCs on the Panigale!'" "It was one of those spontaneous moments that just turned into, 'Game on,' he told us over the phone. 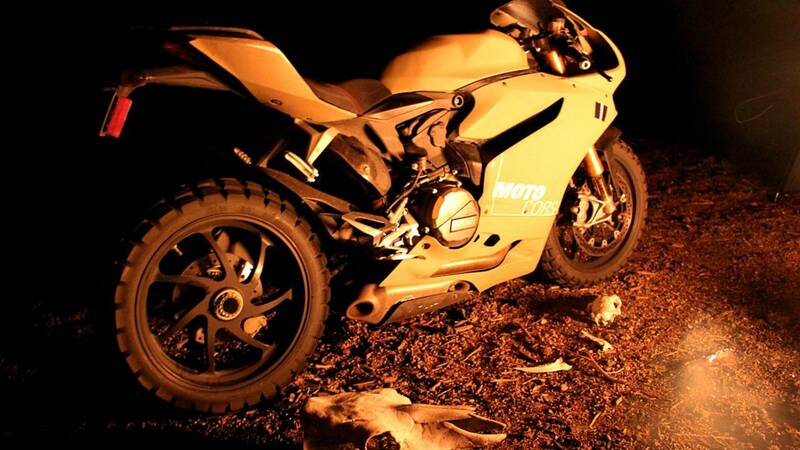 When early photos appeared on MotoCorsa's website, reaction was...controversial. "The funny thing is, everyone seems to think we wasted all this money making it. And, actually, it was really, really easy and really, really inexpensive. 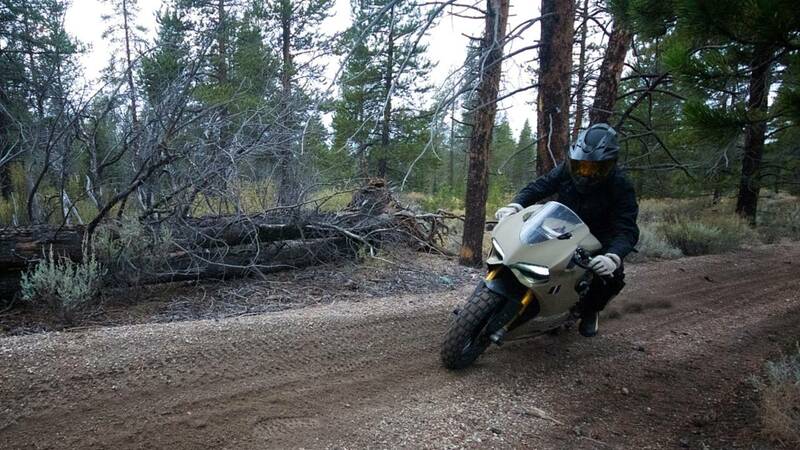 One minute, a set of tires was lying next to the bike and, the next, we had a crazy off-road Panigale." 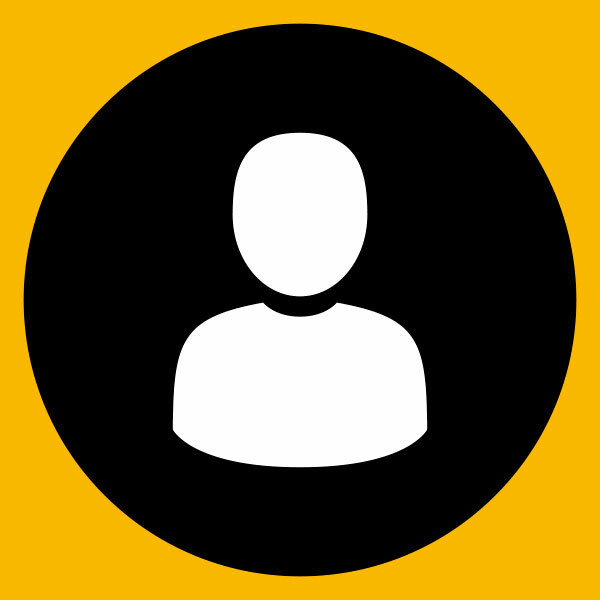 "It looks mostly cosmetic and, frankly, it largely is. We painted the bodywork that Desert Storm color then, depending on your perspective, raised or lowered the suspension. 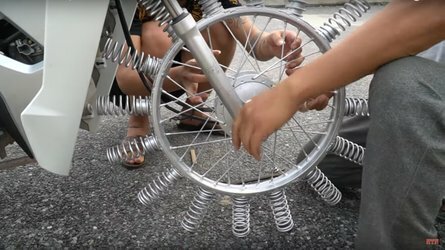 We dropped the forks as low as we could in the triple and raised the shock's ride height as much as possible; the idea being to max out the ground clearance. it probably only got us a half inch or so, but that's something. Then, we went through the suspension settings and made everything as soft as possible so we could mimic an off-road bike's travel." "As you know, with a Panigale S it's all electronic, so we just went into the dash and altered the programming." "Then, we put the TKCs on there and, because we didn't want to ruin nice Panigale wheels and rotors, we bolted on a set of 1098 wheels. We had to shim and space them to make them fit, but we just had them knocking around, so it was worth it." "I didn't want to trash my nice Termignonis, so we took a stock 1199 exhaust and cut and welded a formed crash guard. The whole bottom of the bike is now this really cool formed metal skid plate that protects the exhaust, it's pretty rad." "So far, even just with a few pics on our website, it's gotten way, way more reaction than I thought it would. Manigale is blowing up too, I never would have thought AOL would pick that up. I never would have thought this would have become some viral thing. But with both, there's haters. There's all these guys saying, 'that's so stupid' or "why would you ruin a good bike like that?' Well, why not just have some fun and be silly?" "And, the thing is, it works!" "The ride ended up being five people. One Multistrada, one TerraCorsa and three GS's. 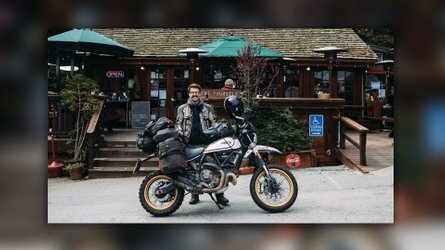 We went and did a 1,200 mile ride over three days in all kinds of conditions. Rain, mud, gravel, grass, street. I'd like to think we did as much of an adventure ride as anyone normal person would, be it on a GS, a Super Tenere or a KTM. We were in the middle of nowhere with no excuses, there's nowhere we went that the Panigale didn't just go right along with us. It was super impressive." 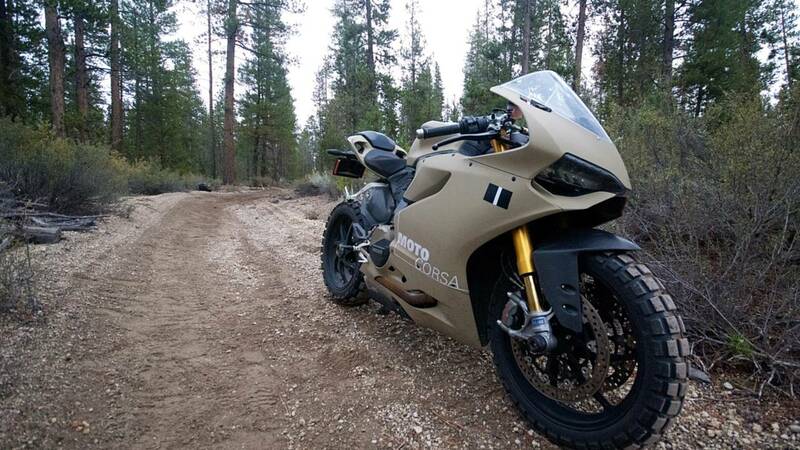 "Here's the thing with the Panigale: it's a surprisingly comfortable bike to ride. Yeah, you have to have equal parts confidence and ability to ride it in a lot of the situations where you'd want to have high bars and stand up, but it just works." "It's amazing what a huge difference just tires make. The Panigale was the only bike that had TKCs and, there were some places where it was the only bike that could get through. We had this one stretch of really, really hard mud and the Panigale with TKCs was the only bike that made it. Those are incredible tires. We had a couple stretches where we were going really, really fast and were like, 'these are bias plys, we shouldn't be doing 120 mph!' We had this horrible revelation where we realized how dangerous this could be if we really let loose." "Look, we didn't single track it. We didn't go off into the mountains with the intention of going somewhere no one else had ever been. But, we went to the normal places you'd go on a relatively decent adventure ride: dirt roads, fire roads, open fields and a couple of tighter places and some tame single track. The Panigale handled all of it." 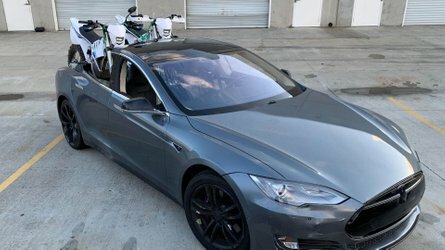 "Next, we want to do a video where the bike is being used like crazy off-road, then rides into the shop and we do a time-lapse where we convert it from dirt to track and take it to a track day. Now, we're just going to put the bike back into track form and I'll be a track day on it down at Thunderhill next month." "This wasn't even planned. It was a stupid adventure, and one that just worked."